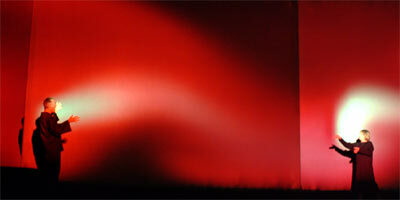 Toshio Iwai traced his work from childhood to present-day in a talk. Our friend Chris O’Shea has copious notes and images on the talk at Pixelsumo, and RÃƒÆ’Ã‚Â©gine Debatty has her own take on We Make Money Not Art. Mr. Iwai also performed at the conference; he describes his experience on his blog. Speaking of the blogosphere, we often get so caught up in novelty that we miss the history of media art and interactive multimedia performance. It’s nice to see some of his earlier works. 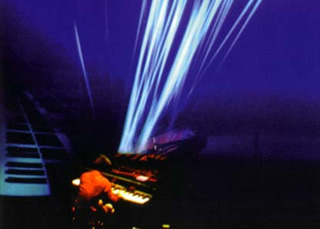 Chris helpfully points us to Toshio Iwai’s 1997 collaboration with Ryuichi Sakamoto, which transformed a grand piano into a visual spectacle, as described in the Ars Electronic archives. Iwai’s course took him from visuals into music, the kind of cross-media trajectory familiar to some of our readers here. Part of what’s exciting about being alive in the digital age to me is this new Renaissance, in which so many of us navigate into unfamiliar media and rethink what they mean to us. WMMNA also has an extensive description of Atau Tanaka, whose research has covered a broad swath of interactive music creation. His latest project: a mobile music device with “body input”, using sensors, accelerometer, and gyroscope data, for music making from children to professionals. Hard to know exactly what this would be like without more details, but it sounds promising. Lastly, from RÃƒÆ’Ã‚Â©gine we have notes, images, and links on Zach Lieberman talking about how to “make the invisible visible”, from interactive visuals that let you draw with your voice to augmented reality. If you aren’t already familiar with these works, they’re well worth your time. Anyone else go to Futuresonic and want to report back yourselves? Anyone going to SIGGRAPH next week in Boston?